It's been such a long time since I've painted something for myself or something that wasn't for someone else that I decided to take some time this past weekend and work on something I've been meaning to do for a couple weeks now. That's a lot of somethings isn't it? A while ago I heard about a contest The Independent Characters were putting on in conjunction with KR Multicase. Looked like a great idea and I vowed to get in on it. All I had to do was send in a painted and based mini in the theme of a Badab War Chapter of my choice. Of course I waited until the last minute to do this. To be fair, I've been doing lots of other things recently. I knew I had a spare Terminator lying around and having just picked up Imperial Armour 9 (The Badab War Part 1), I set out to find something I could paint and send submit as my entry before the February 28th deadline. I told you I waited until the last minute. 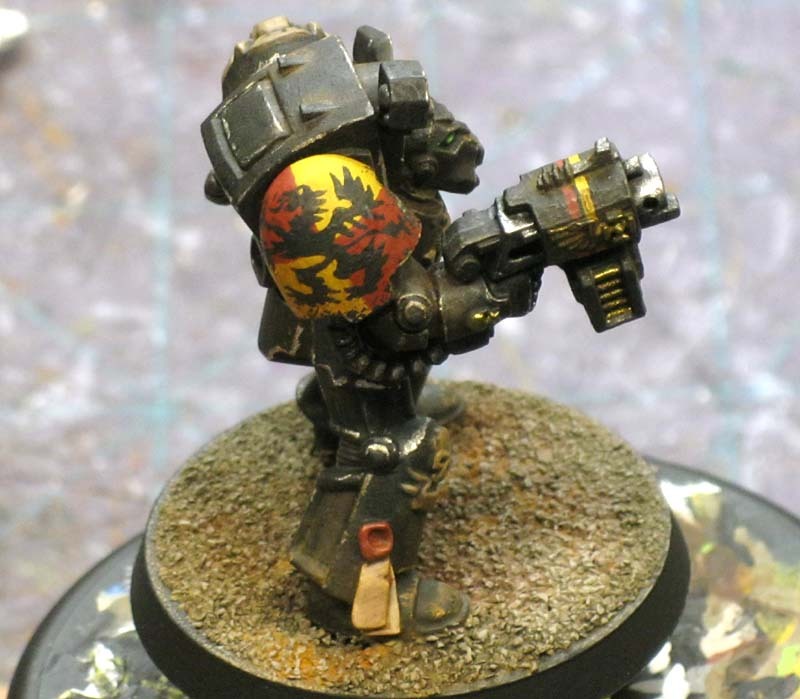 As soon as I came across the Howling Griffons and the terminator they had a color plate of (the small image above from Forge World), I knew I had my guy. And to top it off, he was painted black so it gave me a chance to do a full sized "test model" for my Deathwing painting scheme. How could I go wrong now? I think I did a pretty good job of capturing the feel of the plate, but that's about where the similarities end. My weathering is a little a lot heavy handed as I'm still struggling to find that delicate balance on an infantry model. I seem to do better with vehicles, but scale it down to a troop figure and I'm using too much I think sometimes. His armour looks like it hasn't been cleaned in years. I've learned (by dumb luck) that I can go back in with a wash (using it like paint) and "erase" some of the weathering powders where I go way overboard. The washes are the regular GW ones and the weathering powders I'm using are from Secret Weapon Miniatures. I have no idea what the planet looks like and so I was lost when it came to basing. I tried skimming through the book to see what I could find, but once I get to the pictures, I'm completely distracted. I decided keeping the basing simple (read nothing) was the solution. That and it saved me some time too. Hindsight being 20/20, I wish I'd done enough research to find a suitable resin base I could have used. I think it would have helped the model and the feel overall. 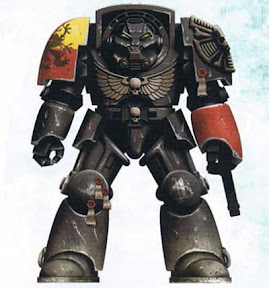 This is the same technique I want to use on my Deathwing minus some small color changes obviously. I opted to go with a bright silver for the chipped paint on the armour this time instead of my original plan to use the gunmetal metallic color. I wanted to see just much much it would stand out in the end once I applied all the weathering. I have to say I like the look in the end. I think it stands out more than the gunmetal did the first time I tried this. I also tried the method where you apply the paint to the edges of your model using the side of your brush. It worked great along the sharp edges where it really comes out looking like chipped metal and a bit erratic, but I had to go in on other areas (like the armour plate ribbing on the back of his legs) and use the traditional method I suppose you could call it of painting it on carefully since the edge method wasn't really working. The rest of the chipped paint (over the red and yellow areas) is done with a sponge believe it or not. It's another method I'm not that good at but figured I would try out. I won't get any better at it if I keep falling back on what I already know how to do. The sponge came from a pack of them I picked up at a dollar store. I cut off a small piece and then tore away a portion of it so the surface was a bit more irregular. I figured that might help me keep away from having everything look uniform when I applied the paint. I've always had trouble getting it to look "correct." When I've used sponges before, my scale seems wrong on the model. I either use too much paint or too little and then it's never in the right place. This is definitely an art and takes some practice to get right. It seems like it's done more by feel and impression than by technical skill. I was a little concerned about the freehand at first. Not only is it complex, I was going to be painting it over a checkered and weathered background. That meant no room to fix mistakes. It's close enough that people recognize it for what it should be with the colors behind it so I'm counting it as a win. Apparently (and I just learned this today) there is some discussion on the larger boards because not all the Howling Griffon paint schemes match up. I don't think any of us are surprised to see GW and FW have produced variations of what should be the same thing. Me... I just copied what I saw in the book and even then I flipped the the Griffon around so he may be facing the right or wrong way depending on what reference material you're looking at. Thank goodness it's only his shoulder I had to do this on. I'm not sure I could paint up a whole army like this without having to resort to decals. The only other freehand is the small number one on his left shoulderpad shield. That's hard to mess up. The stripes on the gun were taken from the book as well. At first I had the gun casing plain black. As soon as I saw the picture, I figured it might help to add them on my model. I think they help the model a lot... better than I thought they would in the beginning. It's a nice splash of color on an otherwise very dark model. In hindsight, I should've made the gun casing a dark grey instead of straight black to help it stand out a little more, but some lessons you don't learn until it's all over. My Wife said she'd put this guy in the mail for me today. Hopefully he'll make to his destination before the deadline. NOTE: This is a repost for Archiving purposes. 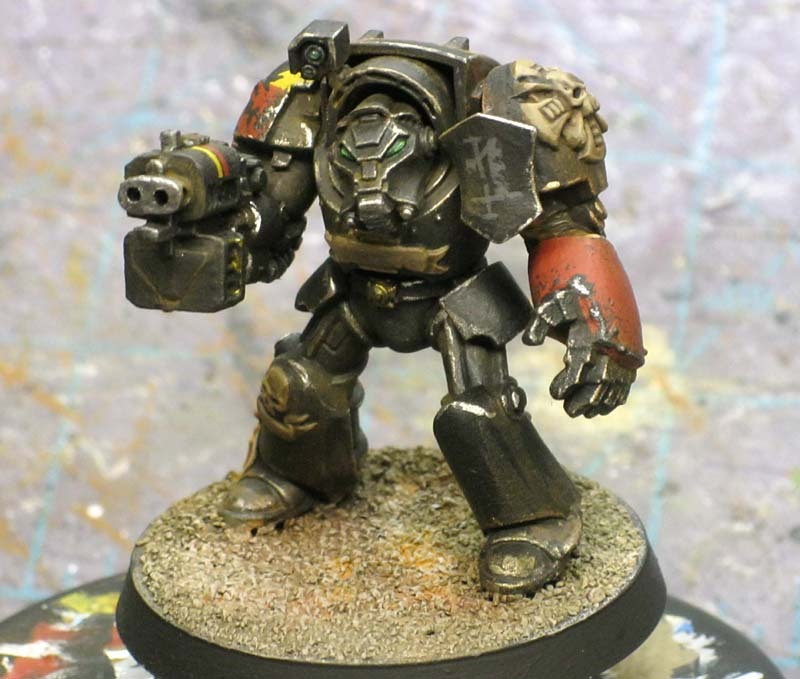 looks a great figure ,loved all your items on the Badab war.i have trouble painting chips on marines at the moment im doing iron snakes for a friend . 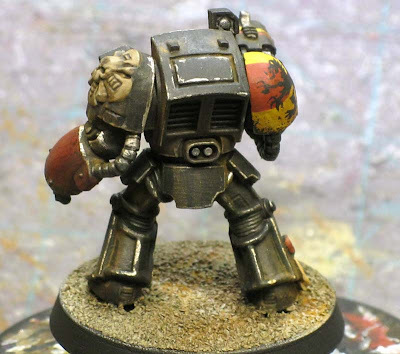 (including the shoulder pads from chapter house) what's the best way to add chips to a model that silver/mettle finish to start with? Anon: That's a great question. I've actually had someone else ask me that recently. Let me put something together and I'll post it up. It can be done, but it's a little tricky to do.